I have won #MerryLittleShipmas contest. Rewards were 24 Premium days [received] and "surprise" worth 50 euro. "Surprise" was a campaign: THE STEEL MONSTERS CAMPAIGN access. Nice. But for sure not worth 50 euro. Moreover: campaign bundle contains 2019 doubloons, which I have not received. So this "surprise" is valued about 40 euro. Not 50. Answer [ID 116810370] which I get for a ticket was: it is not us. We canno into prizes. Those guys from marketing are responsible for rewards. Go for forum. Cry there. Making it short: I have not received reward that is worth 50 euro. What and when can You anything do about this, dear WG? But for sure not worth 50 euro. The sum worth of stuff you get from the campaign was approximately 50eur. 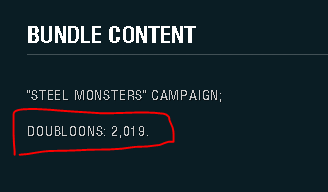 So... it kinda "is"
Moreover: campaign bundle contains 2019 doubloons﻿﻿, whic﻿h I h﻿ave not re﻿ceived﻿. That sounds like the PEF 5-stage mission. You need to play PEF to get that steel. Either that or is it the steel you get from completing the campaign? So again - you need to play the game to get it. Well its sad, and what would have happened if you already had that mission purchased? Tag in MrConway and Tuccy in your original post, you may have their attention easier that way. You yourself even linked to the premium shop, where it's clearly listed as 49.99eur. Misread the Doubloons / Steel part. Clearly from the Campaign you get no Doubloons, and there are no Doubloons listed in the reward image you provided in the opening post. From where did you pull out that you should get 2019 of them? So yeah, as already explained, go ahead and play PEF, dotn bother tagging anyone, you dont really want help. I get only campaign. Without doubloons. And it is worth less than 50 euro in shop. What about this then? And it is worth less than 50 euro. As you yourself said - you got the CAMPAIGN access, not the bundle. And what if finishing campaign is beyond my skillz? Seems like a YOU problem, you might want to blog it. Well that's a "you" issue, not a "reward" issue. Also you have 6 months to do it, can't be that hard. Done if for you :) - He gets a notification whenever anyone links him. What he said, if what you won was named CAMPAIGN access, it would not include 2019 gold. If it was named CAMPAIGN bundle, it would include the gold. Yes, it is kinda strange how they sold this campaign, because for your money you don t really get anything when you pay. Hey, I have also won this amazing "worth 50 euro" prize. Not gonna lie, I am also a bit bummed by the fact that it's price doesn't match the promise that WG made in the contest announcement. Also, to be honest, 4000 steel from the campaign can get me nothing (Flint, the cheapest steel ship is 8700 steel with the coupon), as I am a relatively new (well, 300 battles since 2015), casual player with no aspirations for competitive gameplay, so I don't really benefit from the prize (though I can't really be mad at that, as that's actually "me" kind of problem). The other winner, @Aufklarer_UK had the campaign puchased beforehand, he got some lootboxes as a compensation (10 of the biggest ones if I recall correctly, also not near the 50 euro price tag). 10 Mega boxes to be precise. The prizes you received have a value of around 50 Euros when calculated based on the doubloon value - this can of course differ from a given final prize in the shop. I'm sorry to hear you're unhappy with what you received, we'll try to be clearer about what the prize will be next time. I think this is a **** as the OP won.and got something FOR FREE and is trying to say it doesn't equal the full value...If you don't like it ask if you can give it to someone who would appreciate it. How much of *edited do you have to be to make a thread like this? By accepting these terms and uploading your artwork, you grant Wargaming a worldwide, non-exclusive, royalty-free right and license (with the right to sublicense) to host, store, transfer, display, perform, reproduce, modify, and distribute your artwork, in whole or in part, in any media formats and through any media channels (now known or hereafter developed). Any such use of your artwork by Wargaming may be without any compensation paid to you. How much *edited do you have to be to make a thread like this?